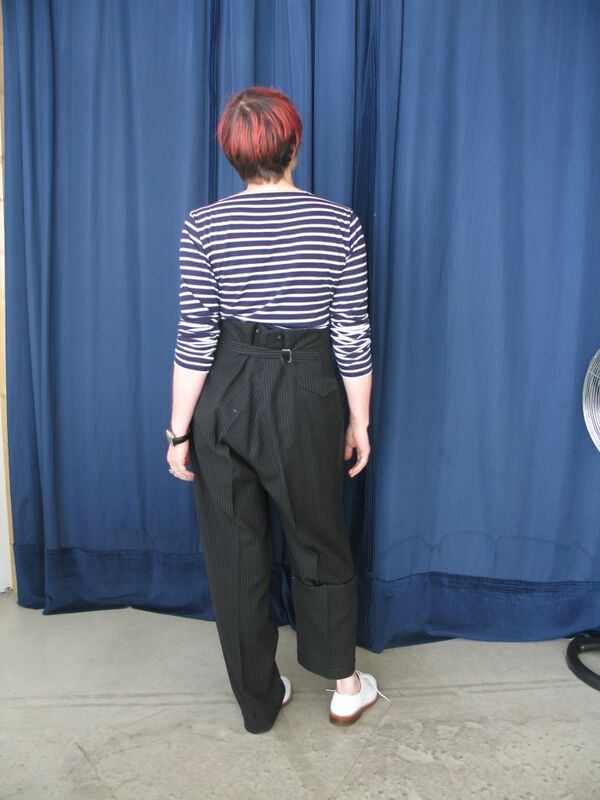 Last week I bought a lovely pair of vintage trousers and challenged myself to make them fit me. You all very kindly encouraged me to overcome my doubts about butchering a piece of museum-quality tailoring and press on. To be fair, nobody could tell at the time exactly what I was up against, least of all me. The pants were huge, at least three sizes too big and a full six inches too long. I’m no stranger to a slouchy trouser, but these were clownish even by my standards and I was by no means sure I could pull it off. I spent far too much time over the weekend looking at avant garde menswear on Farfetch and wondering What Would Yamamoto Do? Still, the fabric is a pleasure to work with, very supple and with lots of body so it holds its shape beautifully. The down side is that every fold and tuck has to drape perfectly. I’ve been trying to channel Yohji-san in the hope that the master would look over my shoulder, give me the nod and perhaps guide my hand once in a while. After much trial and error I think I’m finally on track to a wearable garment. Who knows, maybe he’d even approve this alteration. In the interests of full disclosure, here are a few before and after pics, along with some nerdy tailoring details. It still needs tweaking but I’m pretty sure I can get this to work. I want to preserve the original tailoring so the only cuts I’ve made are to the leg seams, where I’ve put deep tucks front and back. This instead of hemming so as to keep the original cuff, which I will line with contrasting fabric so I can turn them up. I shaped the legs by making the inseam a little shorter than the outside seam, giving a more contemporary silhouette and making said turn-ups behave themselves better. Too much alteration to the crotch looks like a bad fit, so I’ve taken out little more than an inch there and done the rest with a couple of darts across the back, making the deep rise look intentional. The tucks on the back leg help control this somewhat and there’s a trick or two I have yet to try on the inside to make the seat drape nicely. All needs yet more tailoring but I’m quite satisfied with the result so far. I think these are going to be workhorses in the winter season. I've just found these amazing vintage men's dress pants in a thrift store for the price of a sandwich. No tailor's mark but definitely bespoke, possibly Weimar era German. Gorgeous fabric, unbelievable finish and fabulous condition for their age. These are pants for a very big man, in every sense of the word. I could probably sell them on for ten times what I paid for them but I'm contemplating remodelling them. These are the sort of pants I want to wear all the time but can never find (huh?! what about the three pairs of black slouchy tailored pants already in my closet?!) *ahem* Well, almost never. I've pinned them up in the picture to show what I have in mind. It involves moving a few buttons to fit the waist, reshaping the legs slightly and sewing a seam at knee level, although I'd probably go shorter than this. It's not intrusive, it preserves the tailoring detail, but actually, it feels like butchery. Alternatively, I could keep them around as an inspiration piece. Or I could make my friendly neighbourhood vintage dealer very happy. What do you think? Alter? Conserve? Pass on? ETA: a few additional pictures of these awesome pants. Still not sure I've done them justice.